Crews replaced roofing, windows and other exterior elements. 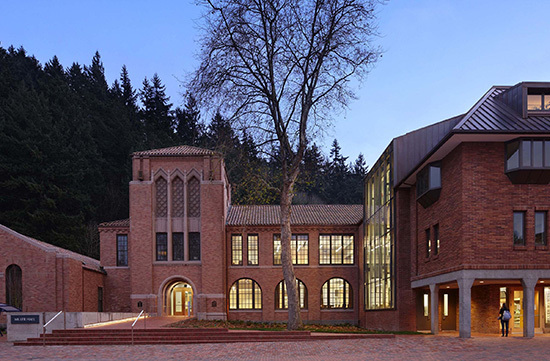 The renovation of Miller Hall combines targeted alterations with a thorough reorganization of two existing wings to reinvigorate a historic building and the surrounding campus. Decades of piecemeal remodeling had divided Miller Hall into inhumane spaces without light and air. Users were disoriented by the building’s three stairs, nine levels of floors and two wings, and much of the building was inaccessible to mobility-impaired students. This renovation began by reorganizing program spaces around the original architectural fabric, stripping away numerous haphazard interior additions. Targeted incisions into the existing building restore wayfinding, new light wells orient users in interior hallways, and new vertical circulation cores knit together the two wings. The project team won back space wherever it could be found. New dormers reclaim a previously windowless attic, and an existing service basement was excavated into usable computer classrooms. The most visible addition, a green-roofed collaboration space, now fills the previously neglected central courtyard.